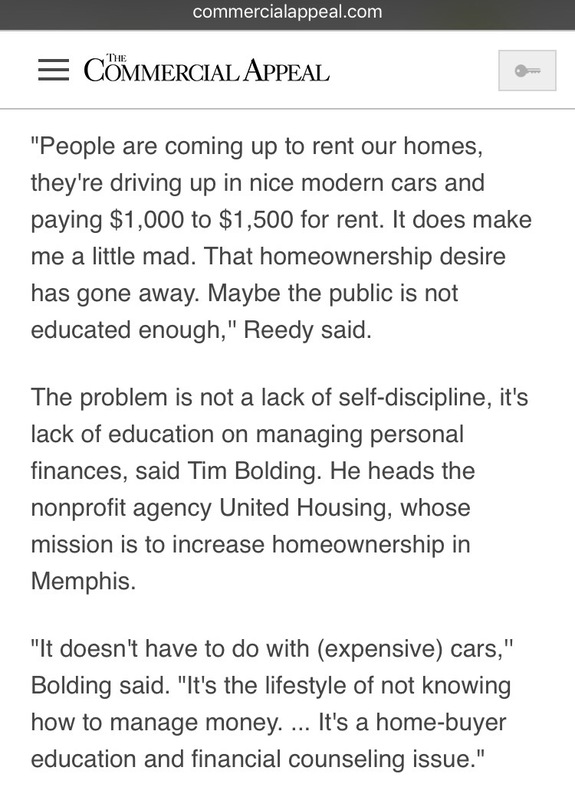 The article in the Commercial Appeal about Memphis being a hot spot for flippers and families paying more to rent than own highlighted the failure of banks to innovate. Really think of themselves as life partners helping their customers successfully navigate through life’s major financial challenges? Why do banks leave educating potential homeowners to non profits? Why aren’t banks offering classes, savings clubs and savings games/products that leverage peer pressure, gamification, laziness and education to help people save? All it takes is a little empathy, understanding human behavior and creativity combined with human-centered design to identify profitable ways to really help people and make millions in the process. Banks could host a weekly home ownership club, similar to a book club or a Tupperware party, where people learn and commit together to save. And the bank can offer savings apps and products to help people reach their goals, sort of like Mint but specifically designed to help people save their down payment, e.g. automatically allocating a percentage of their paycheck to a down-payment fund. And as they hit milestones, the bank along with their marketing partners, E.g. Home Depot, Ikea, Realtors, and others who will benefit once they become homeowners, can reward them with gift cards, etc. along the way. And since the banks will have been tracking their clients progress, they should theoretically have better insight to their reliability, beyond just their credit score and pay stubs. Maybe my ideas are way off base, but after reading the article, I can’t help but believe there has to be a better way to help hard working Americans become homeowners. First Tennessee, Regions Bank, iBank and others, what say you? Or maybe some banks are doing innovative things to help their customers become homeowners. If so, I’d love to hear about them.